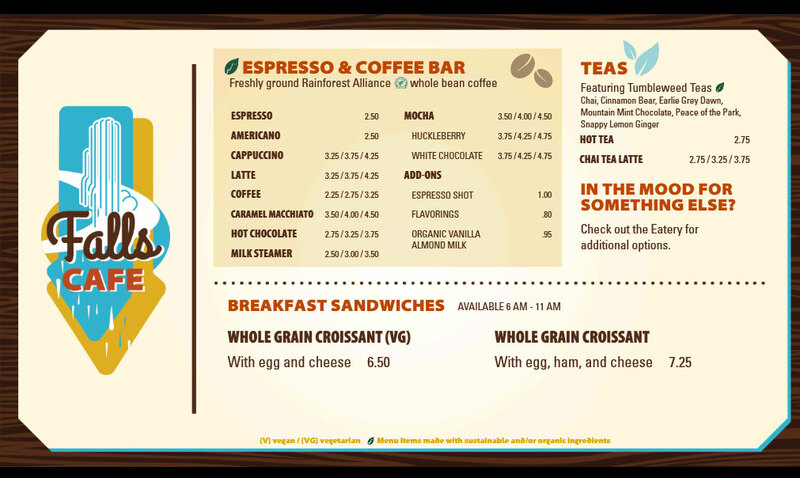 For those on the run, the Falls Café offers house-made grab-and-go flatbreads, sandwiches, salads and snacks. Open for breakfast, lunch and dinner, the Falls Café also offers specialty coffee drinks and sustainably produced keg wines and beer. Lunch/Dinner: 11:00 A.M. – 9:00 P.M. In addition to the Falls Cafe there are other options to enjoy a meal while visiting the Canyon area of Yellowstone National Park. Visit the Canyon Lodge M66 Bar & Grill, The Ice Creamery, Washburn Lookout, and the Canyon Eatery.